Inbox Toolbar by Inbox.com, Inc. - Boost Your PC. Inbox.com Toolbar is a browser add-on which adds shortcuts to your Internet browsers. The search engine that is used by this toolbar is a modified Google search with not related advertisements which are not clearly separated from organic search results. The installation of Inbox.com Toolbar bundles a number of shareware products inclduing PC Powerspeed 24x7 Help, AppGraffiti and RebeatInformer. Download Boost and enjoy your PC. Remove Inbox Toolbar from your PC. Why should I uninstall Inbox Toolbar? Other programs by Inbox.com, Inc. Files installed by Inbox.com, Inc.
Inbox Toolbar by Inbox.com, Inc.
To the right of the list item, click the Uninstall button and Boost will completely remove Inbox Toolbar from your PC. Use Add/Remove Programs control panel in Windows makes to uninstall Inbox Toolbar. Follow the appropriate instructions below to use this control panel. Select Inbox Toolbar from the list of programs, and click Uninstall. Alternatively, right-click the program and select Uninstall. Select Inbox Toolbar from the program list, and click Uninstall. Alternatively, right-click the program and select Uninstall. Select Inbox Toolbar from the list of programs and click Remove. 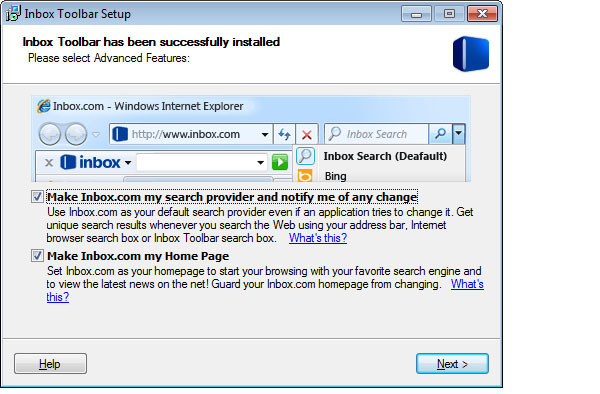 Boost helps you remove Inbox Toolbar by Inbox.com, Inc. and clean your PC.